"This will be our biggest trek yet," says metal outfit's singer M. Shadows.. Last month, Avenged Sevenfold wrapped a sold-out tour in support of their latest album, The Stage. The month-long trek found the group playing arenas around the country, but singer M. Shadows tells Rolling Stone that the metal outfit's upcoming summer tour "will be our biggest trek yet. In terms of production and song selection, it feels like the whole cycle has been leading up to this." The tour kicks off July 22nd at the Xfinity Center in Mansfield, Massachusetts and wraps September 2nd at the Cynthia Woods Mitchell Pavilion in The Woodlands, Texas. 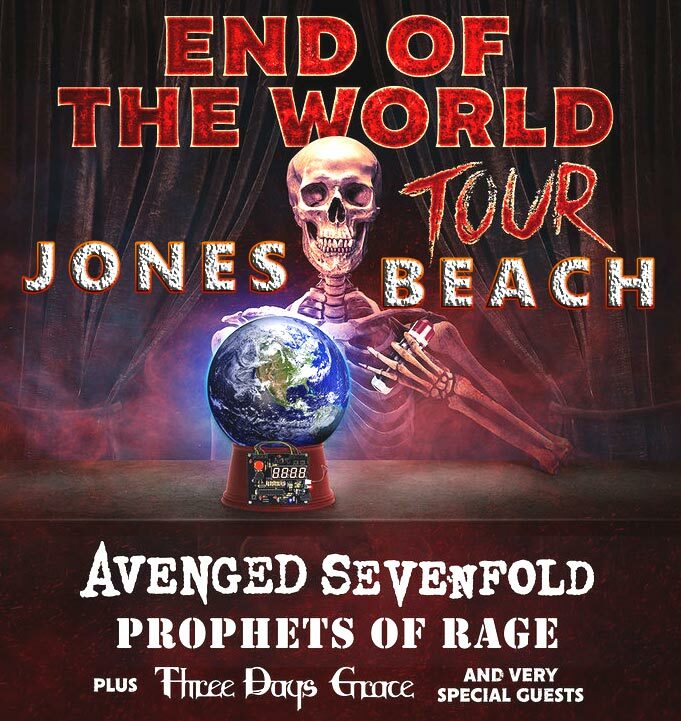 Prophets of Rage will join Avenged Sevenfold throughout the trek, while Three Days Grace will serve as support. "They have experience from an era that we respect," Shadows says of hitting the road with Prophets of Rage. "Growing up it was the music of the Nineties that spoke to us the most. These guys are legends and I hope the two audiences can come together to make something special." "Awful pop dominating the airwaves? Political chaos across the land? Wanna fight back? Well The End Of The World Tour is here," Prophets of Rage’s Tom Morello said in a statement. "Prophets of Rage & Avenged Sevenfold have always played absolutely uncompromising music. If you want your summer loud, raw and fearless we'll see you in the pit." For Avenged Sevenfold, this summer run marks the group's third major tour in support of The Stage, which was released in October 2016. Shadows says the band plans to expand and tweak their setlist from those previous runs, while also adding a few props to their stage show such as pyrotechnics. The tour is part of Live Nation's "Ticket to Rock" promo, which offers fans the chance to buy multi-ticket bundles to a variety of other summer tours. Even after two massive tours in support of The Stage, Shadows says there are parts of Avenged Sevenfold's set that he's grown particularly fond of, such as opening each show with the album's title track. He adds that a portion of The Stage cut "Exist" "adds a cool dynamic to the set," while he's enjoyed unearthing older tracks like "Chapter Four," "Second Heartbeat" and "Burn it Down." Avenged Sevenfold released The Stage a year-and-a-half ago, but Shadows says the subject at the record's core – artificial intelligence – has stuck with him. "You see the world in a different light – an exciting light when you base your beliefs in science, in facts," he says. "I wouldn’t want to live any other way and hopefully this album interests people enough to want to educate themselves on the subjects we discuss. I've also realized playing these songs live that some people want to come to a show and not think about what the songs mean and that’s OK, too."